Outside of being a cycling instructor she enjoys teaching, tutoring, skating, playing scrabble, or just relaxing while reading a book. Can you believe that Alysia once weighed nearly 200lbs? A lot of times you look around and its the “in thing” to be thick. Eating unhealthy, doing any and everything she wanted to without any limitations caused her to time to look in the mirror one day, thick had turned to fat! She was labeled Obese according to my BMI. Alysia knew she had to do something! She joined a gym and didn’t have a clue what to do. Alysia happened to hear the people in the cycling room and was thinking, “they are getting crunk in there”. The next time she stepped the gym she knew she had to try cycling. She went in, became addicted, and can now she can thank cycling for a 50lb weightloss. Alysia is now 70lbs down from where she started and loves to help others along their fitness journeys. She became a cycling instructor to share this passion. She is so glad to have found a fun, and effective exercise class. 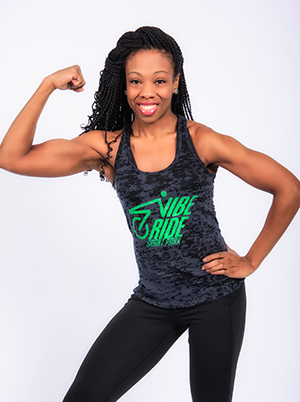 Since getting certified in cycling, she has also gained certification as a personal trainer and love seeing people transform their lives.